The often tedious but necessary chore of vacuuming means different things to different people, depending on what has to be vacuumed. If it is a home that is being cleaned, the typical array of items being vacuumed will be dust, food particles, and perhaps an occasional spider web. If it is a business establishment, it may involve a wider spectrum of dirt or debris to be vacuumed. There may be more outside dirt that has been trod in by customers or the business staff. There may be stairs to vacuum. In addition, while upright vacuums can do a satisfactory job on a floor, canister vacuums are much more convenient and versatile in the long run. 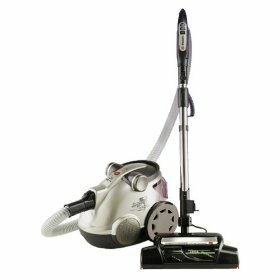 In addition to those benefits, with the advent of hepa-sealed systems, canister type vacuums are the healthier choice as well. There are many more benefits to using a canister model as opposed to an upright model. The canister will have a flexible hose compared to the rigidity of an upright model. For the most part, getting around corners, into crevices, and behind and underneath furniture is much easier with the hose of a canister vacuum. In addition, a canister has more suction power for cleaning carpets. Also, an upright’s harsh beater bar will wear down a valuable rug much faster than the gentle rub of a canister head. With a canister, you are only pushing the head of the cleaning end, not the entire vacuum unit. That makes it lighter to push and easier on the nap. Even if the upright unit has a motor drive that pulls the vacuum forward that means there are more mechanical parts to break down that may result in costly repairs. Most canister models also have a retractable cord making it easier to end the chore without having to wind the cord manually onto the handle. Anybody who has had to carry an upright unit up and down stairs will attest to the awkwardness of it. The upright is cumbersome. The canister has a handle. The canister also has the ability to vacuum corners near the ceiling. Try and vacuum a ceiling cobweb with an upright and you will understand the difference. When needing to vacuum corners, carpets, ceilings, underneath furniture, crevices, upholstery, and other places other than a wide-open area, you need specific tools. Those tools are usually not attached on board an upright model. While vacuuming with an upright and holding the cord to keep it out of the way, you cannot hold on to the tools at the same time. With a canister model, those extra tools are normally attached to the unit, making it easier and faster to change tools and continue. Speaking of hepa, which stands for high efficiency particulate air, most newer canister models have that feature. It is designed to reduce the number of particles that go into the air that cause irritable reactions in people that have allergies. It is the most important feature that has come out of the vacuum cleaner industry in many decades. Many air filter products are hepa rated for their ability to reduce airborne molecules and contaminants. Canister vacuums are in that group of products because of the exhaust air that is filtered out. So, no matter which type or brand of vacuum cleaner you choose, you should make sure that it does have the hepa feature. PreviousBeing indecisive with how to design your nursery?